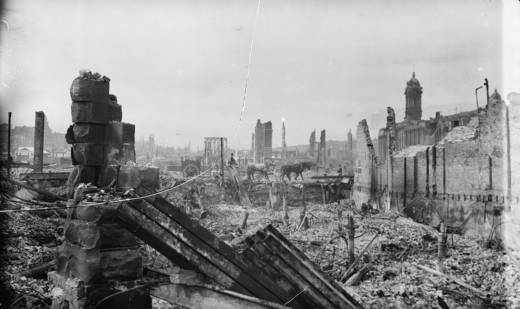 When the 1906 earthquake hit San Francisco, “the hills rolled like great billows and cracked open,” according to one Australian immigrant’s account. Almost a minute of violent shaking shocked northern Californians. But like all quakes, that quake announced it was coming, even if people couldn’t harness the information fast enough. Now, scientists from a broad consortium, including the U.S. Geological Survey, Caltech, and U.C. Berkeley, are seeking to use that principle as bedrock for an early warning system for the West Coast. ShakeAlert has been sending alerts to selected users in California for six years. This year, proponents say the still-developing system is on track to meet its goal of beginning limited public notifications. Two years into a pilot phase, ShakeAlert is partnering with universities, private companies, and the City of Los Angeles to test sounds, messages, pathways and locations where people could hear alerts. At least one mobile app will become publicly available later this year. ShakeAlert is founded on a network of sensors: fully built out, more than 1,600 seismometers networked with redundant servers will stretch across Washington, Oregon and California. By the end of this year, California’s sensors will be 75 percent complete; they’re particularly dense in Southern California, where hundreds of faults are capable of delivering earthquakes of magnitude 6.0 or higher. The data they capture comes when earthquakes give us a little notice: they release energy, like a wave. “If you snap your finger like this, you actually model a fault,” de Groot says. That snap is the fast moving and harnessable signal of impending shaking. “It's called a P-wave, it's traveling something on the order of about four miles per second. And that reaches the surface first.” More destructive S-waves follow. ShakeAlert’s algorithms, still under development, use P-wave speed, location, and intensity, among other factors, to predict where the shaking will be the worst. Once alerts are set, the goal is to send them without human intervention or review, so that they move fast. A Santa-Monica based company called Early Warning Labs has developed an app aimed at alerting the general public. 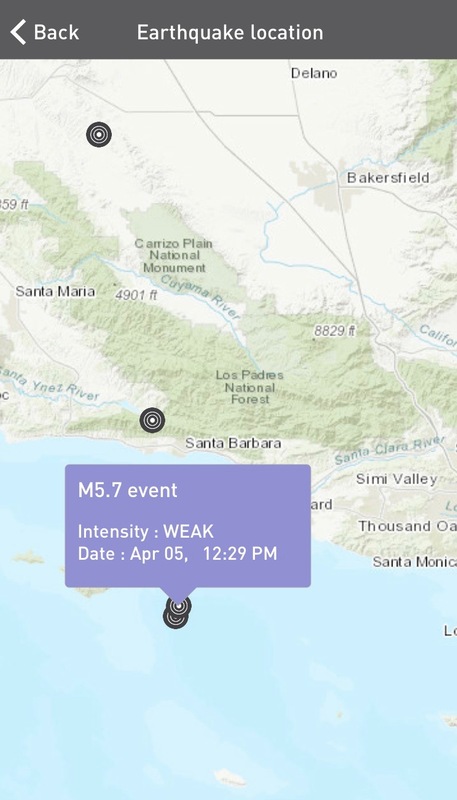 I saw it work firsthand with founder Josh Bashioum in Santa Monica on April 5, when a 5.3 quake centered near the Channel Islands shook Los Angeles County. The app QuakeAlert offered beta testers between around 10 and 30 seconds warning, and an audible text-based alert punctuated with a horn sound. That’s valuable because a UCLA study has found that about half of injuries caused during the 1994 Northridge quake stemmed from falling items above victims. 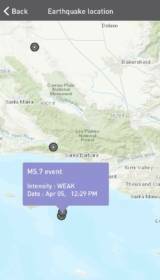 With at least ten seconds notice, QuakeAlert message recipients had enough time to move away from dangerous areas, and drop, cover, and hold on, as the app and emergency officials advise. Soon enough after the quake, Bashioum’s phone was blowing up with normal text messages reporting how fast his app QuakeAlert worked. “Yeah, we gotta follow up with some customers, definitely,” he said, sounding pleased. QuakeAlert will be free: it’ll go public sometime this summer. USGS’s de Groot acknowledges the problem. “There currently is nothing fast enough to get the alert out in a way that we would like it,” he says. Moving alerts through the federal Integrated Public Alert and Warning System, like AmberAlerts and weather warnings, takes three to seven seconds, eating up the notice that ShakeAlert could offer. The pipeline phone companies can offer for sending simultaneous mobile push notifications is limited; messages could be tiered, but that’s not easily automated. 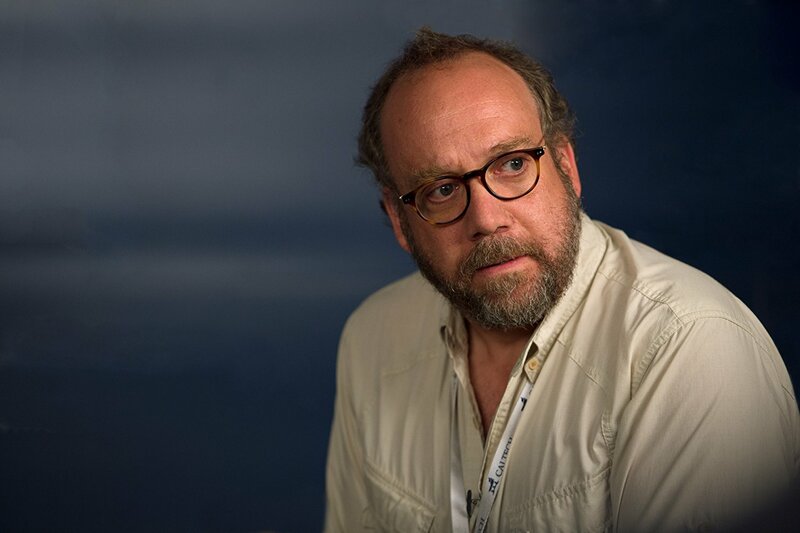 It wasn’t that long ago that earthquake prediction was the stuff of blockbuster fantasy: in the 2015 film San Andreas, Paul Giamatti played a fictional seismologist who developed a warning system before a (scientifically impossible) quake. ShakeAlert’s architects won’t guess publicly when the federally-funded system will be ready to distribute its own alert. But they’re welcoming partners who want to use California as a living laboratory for real-life applications of the system. Bashioum’s Early Warning Labs is doing some of that work, including testing alerts that broadcast through fire alarms. He believes public testing and deployment will spur demand for better warning systems.